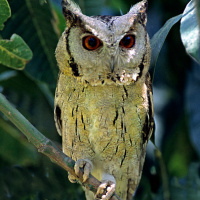 The Indian Scops Owl is small owl with large, conspicuous ear-tufts with dark outer margins. 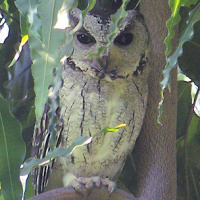 It was formerly considered a subspecies of the Collared Scops Owl (Otus lettia). Typical call - Tissamaharama, Sri Lanka. March 2016. CC Peter Boesman. Description: The facial disc is pale greyish-brown with a distinct blackish rim. The forehead and eyebrows are paler than the surrounding plumage. Eyes are hazel-brown to dark brown, and rarely yellowish-brown. The bill is greenish horn-brown, with a darker tip, and paler lower mandible. Cere is dusky green. The crown is nearly uniform blackish, and distinctly darker than the mantle. Ear tufts are long and prominent with dark outer margins. 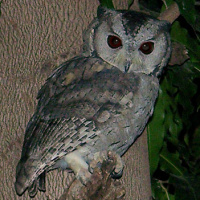 Upperparts are uniform greyish-brown with darker and paler markings and long black streaks. Outer webs of the scapulars are dirty cream or whitish-buff, are not very prominent and do not form a distinct scapular stripe. Flight and tail feathers are inconspicuously barred lighter and darker. Underparts are ochre-buff, becoming paler towards the belly, with relatively few dark shaft-streaks and wavy cross-bars, especially on the upper breast and flanks. Legs are feathered pale greyish-brown to white to the base of the toes. Toes are coloured brownish-flesh to greenish-yellow and have pale horn-brown claws. Size: Length 20-22cm. Wing length 143-185mm. Weight 125-152g. Females are larger and heavier than males. 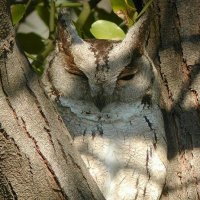 Habits: The Indian Scops Owl is a nocturnal bird that is rarely seen during the daytime, when it hides in thickly foliaged trees. Voice: The male's song is a series of frog-like, regularly spaced, interrogative wuatt? notes interspaced by pauses. They also produce an occasional series of slowly repeated bubbling or chattering calls on an ascending scale - ackackackack... These are strung out for about five seconds and commonly interposed with normal notes, but sometimes heard independently. 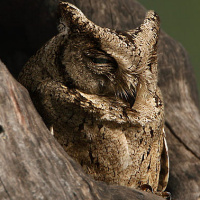 Hunting & Food: The Indian Scops Owl feeds mainly on insects including beetles and grasshoppers. They will also occasionally take vertebrates such as lizards, mice and small birds. 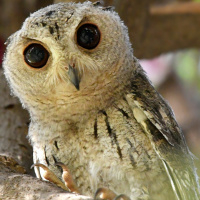 Breeding: Little is known about the breeding biology of this owl. They nest in tree cavities at moderate height. Females lay 3-4 white roundish eggs averaging 33x27mm. 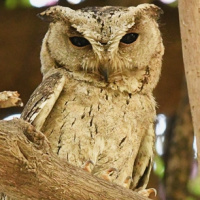 Habitat: The Indian Scops Owl lives in forest and secondary woodland, desert vegetation, and groups of densely foliaged trees in gardens, mango orchards and other fruit trees around villages and cultivations. Ranges from lowlands to 2200m elevation. 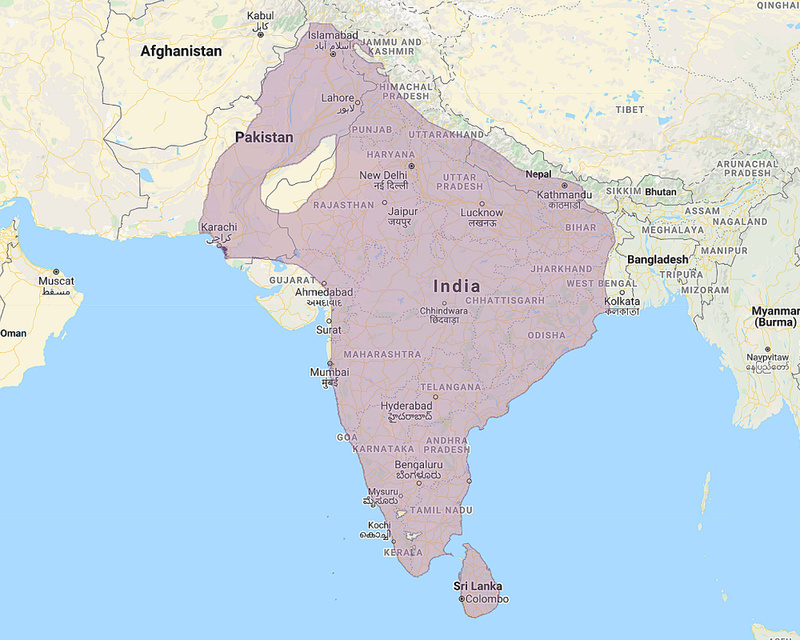 Distribution: South Pakistan, northwest Himalayas, India east to western Bengal, including Himalayas from Kashmir east to central Nepal, and south to Sri Lanka. Original Description: Pennant, Thomas. 1769. Indian Zoology (Indn. Zool. ): p 3, pl. 3. 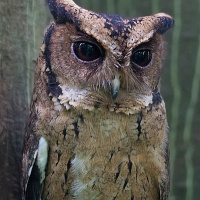 See also: Other owls from Asia, Genus: Otus. Page by Deane Lewis. Last updated 2015-09-29.